In which we visit with Shambhala practitioners from all walks of life to hear stories about their life, livelihood and how their meditation practice permeates their everyday experience. 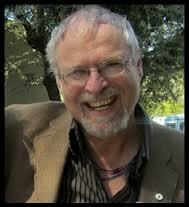 “Building a healthy economy is not about dreaming it, it’s about building it,” Ron further explained. “This is really an action-based approach to making a healthy economy happen and it’s engaging people at a level that they seem to resonate with, just the way we experience the arising of basic goodness.” Ironically, the contract for Creating Good Work arrived while Ron was at Vajrayana Seminary at Karme Choling two years ago. “Auspicious timing!” But let’s step farther back in time. “The moment I heard about social entrepreneurship in that pub,” Ron said, “all the bells and whistles started going off in my head. I realized this was where I needed to be, to apply the business acumen I had developed, and to help social entrepreneurs to become better at running the enterprises they were operating.” Ron eventually worked for Ashoka for two years and after that went to work for Volunteers of America in Los Angeles (VOALA), CA. It was there that he started a social entrepreneurial incubator. For the next two years, he learned and worked to formulate the whole process of Social Entrepreneurship in LA. He described it as an amazing opportunity. The core message of this book is building a healthy economy. There are three aspects to this: nurturing resilience, creating work that is meaningful and purposeful, and creating enough wealth. The first step of nurturing resilience is all about change – the willingness to change, allowing others to change, and making sure change doesn’t burst the boundaries you have established for running your operation. Creating good work is about working with groups and organizations to create work that shifts our economies, and at the same time developing work that is meaningful and purposeful. Creating enough wealth comes as a natural outpouring of the first two steps, and this topic is further explored in the book. “In our entrepreneurial training,” Ron went on to say, “we’ve started incorporating meditation instruction so that all entrepreneurs have the opportunity to sit. It’s a key aspect of leadership because leadership is a reflexive process, not a reactive one.” So, it comes full circle. 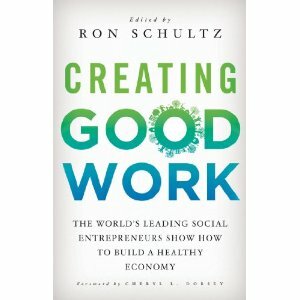 Ron Schultz is the editor of Creating Good Work, is the founder and President of Entrepreneurs4Change. He has written or co-written along with having published 22 previous books including: Coherence in the Midst of Complexity, Adjacent Opportunities – Sparking Emergent Social Action, and Open Boundaries: Creating Business Innovation through Complexity (with Howard Sherman). Very cool. Look forward to reading this! Social Enterprise in China entered a few years ago as the white knight that would find the ideal marriage of corporate social responsibility and community development. But despite all the hoop-la, it hasn’t worked out that way, because the major indicators of poverty like infant and maternal mortality the responsibility of the government. When they figure out how to stop poor mothers from dying in pregnancy and childbirth, then the sea will change. Some people believe that the answer is making people rich — such as happened in poor Tibetan regions when Han Chinese people started buying mastiffs. Then the buyers moved into some other conspicuous consumption du jour and the market dropped out. Same with cordyceps sinesis and Pu-er tea. There are foundations here that get Tibetans to make traditional designed back packs, and attache cases. Tibetans don’t use backpacks and don’t use attache cases. The question is really not one of economy, but the kind of arrogance that believes that the best friend of culture is money. Why not help people to create the expressions of their culture that are getting lost to materialism? The problem is that to do that you have to ask questions, not of the members of a society who are as ambitious as successful western entrepreneurs, but to common people. The problem is that these people are slow and it might take 10 or 20 years to get an answer. This is not a solution made for our speedy society. Maybe people will hear that and think, “he wants to keep them poor.” But actually no one has actually asked these ultra-poor people what they want. There are schools for orphans here, many of them, that teach this and that. I asked the headmaster, a foreigner, “since 1/2 of the Tibetans are nomads, how does what you are teaching help them to become better nomads?” He said, “maybe they shouldn’t be nomads.” Case closed. The problem is that all these things are so far downstream from basic stuff like 5 nuns dying a year from hepatitis in a big nunnery, or pregnant women facing a much bigger (3x) threat to their lives that a soldier in Afghanistan. Or 1 in 5 children dying before they are 2. This has nothing to do with enterprise and to tell the truth, nothing to do with religion and everything to do with helping very poor people to have access to health and life. This is the business of public health. Sorry to rant, but social enterprise is just another myth du jour for cultures that are imploding for reasons having nothing to do with money. Lee – I hear your concerns re current attempts at social ventures, but rather than rejecting “social enterprise” as a myth, maybe regard it as a possibility that can be shaped and furthered by your experience. please – let’s continue the conversation! I’ve read this over twice and find that there is no example given of a social entrepreneur. How is a social entrepreneur different that a regular run o’the mill entrepreneur.? There there is “satisfying work” that benefits others, like? Then there is “building the economy,” by what system? We still have the same old capitalist system as the undertow so anything a social entrepreneur is going to field will still be under that umbrella. Then, suddenly, the term leadership is thrown in there. This entire explanation is replete of examples. I realize you might then say to me, “read the book.” That would be fine but if the same non-objective dialogue is employed I’d rather save the cost. Gimme somethin’ to hold on to here…anything…sans jargon.